Just like bread is incomplete without butter, Gaming is incomplete without a Headset and not just any Headset but a Good one with loud and clear sound production and a design that is not a drag and offers comfort for using it for hours of gaming. 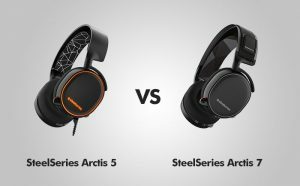 So, here is a comparison between two of the best and biggest sellers of Gaming Headphone segment: SteelSeries Arctis 5 and Arctis 7. Design and Comfort, these are the two things this headset is known for. The design of SteelSeries Arctis 5 is one of the funkiest in the similar range of Gaming Headphones. Its design has everything covered up, it has the style, it has comfort, it has that amazing RGB pattern; it has every shred of awesomeness that you should seek in the design of a headset. The Exclusive Airweave Ear Cushion fabric is very soft and provides better grip and support to keep your ears cool and dry. With the Ski Goggle Suspension headband, the weight of this device is distributed across your entire head which makes it easier to wear them for a long time without any issues with pressure points. The Prism RGB illumination of SteelSeries Arctis 5 gives you the freedom to choose over 16.8 million color patterns for the configuration of the outer light rings. The headset of SteelSeries Arctis 7 is considered as one of the most durable wireless headphones in the marketplace. These devices are made for rigid usage, its Lightweight Steel alloy makes it even tougher. This device has an inspired athletics performance design and its ear cushions are made up of Airweave fabric. The on-ear chat mix dial on the side of the earbuds make the device more accessible and help to increase the field of its usage. Apart for all these attributes, the biggest highlight of this headphone is its wireless design which allows you to connect it to your PS4 or Xbox one without any hassle. SteelSeries Arctis 5 produces great sound with the help of its 7.1 surround sound feature which is backed up by DTS technology. Its speaker drivers are developed with such precision that you have a complete control over its Sound production which can be controlled by SteelSeries Engine software. The drivers of this wired gaming headset device are pretty reliable and produce detailed and balanced sound with ultra-low distortion so that you can enjoy your movies, music, and games to the fullest. The microphone provided in SteelSeries Arctis 5 is a very good piece of technology as it gives you studio-quality voice clarity and cancels any background noise on the go providing the listener with a complete stereo sound experience. The Sound production is one of the strong suits of SteelSeries Arctis 7, it features a Lag-free wireless audio output module that allows this headphone to offer sound without any dropout issues. The S1 Audio Driver helps this Bluetooth enabled headset to produce a very balanced, detailed sound without any possible distortions. These headphones feature a complete surround sound experience with the help of DTS 7.1 technology which produces a stereo audio. The auto-speaker switching Feature enables this device to gives the right audio output at the right time, as it automatically mutes the line out jack when the headset is powered on. SteelSeries Arctis 5 is built with a Durable plastic material which is quite sturdy and can withstand rough usage. With features like Chat Mix dial which allows the user to adjust the balance between chat and game volume and easy to access on-ear Audio controls, this high-end gaming headphone is a big contender for your wish list. You can use these wired headphones with most of the modern music enabled products like Mac, PC, and PS4, these are even compatible with Mobile and VRs. Apart from these hardware perks, this headset has been renowned with many awards as well. It has a long and durable cable with a length measure to 3 m. which gives you the advantage to using these even from some distance. The cable of this wired device has a Rubber material and at the end, it can be connected with an adapter of 3.5 mm or a 4-pole plug as per your need. SteelSeries Arctis 7 is a complete gaming headphone which contains all the necessary features that a user might expect it to have. Its Lag-free 2.4 GHz wireless audio output ensures that you do not miss any of those epic gameplay moments. Not only just gaming but this wireless headset is also a really good ally off yours in case you are a music lover or watch movies often. Its Microphone frequency response is quite astounding as it catches every sound between the frequency ranges from 100Hz to 6500Hz. This headphone has a wireless audio range of up to 40 ft or 12 m. which is quite sufficient and packs witch a powerful lithium-ion battery which ensures a 24-hour backup, so you do not have to worry about running out of power. PROS: Attractive design with Prism RGB Illumination / DTS surround sound. PROS: Lag-free wireless audio output / Long battery life. CONS: Wired headphones / issues with ChatMix dial. CONS: Basic design / connection issues. Both SteelSeries Arctis 5 and SteelSeries Arctis 7 are a great presence in their respective league but if you have to choose between the two you should consider buying SteelSeries Arctis 5 as not only it is almost 60% the price of SteelSeries Arctis 7 but also it has some cool features like the Prism RGB Illumination and designer Ski Goggle Suspension and as for the sound quality, both the Headphones reside the same audio card so, there is not much difference in it. Also, a major setback for SteelSeries Arctis 7 is that in order to connect the microphone’s output with your Xbox or PS4; you will have to use an Adapter jack which basically kills the purpose of being a wireless model.